How does tracking work and why is it useful? GPS technology has expanded rapidly in recent years, and is increasingly being used as a safety measure, not only for friends and family but employees. Businesses around the world are increasingly adopting lone worker tracking through mobile apps and devices. StaySafe is one such app making use of GPS technology to monitor and ensure the safety of lone working employees. What is lone worker tracking used for? Lone working employees work away from a set base and direct supervision. This means that if they suffer an accident or incident, knowing where they are, is perhaps the biggest priority in getting them the help they need. 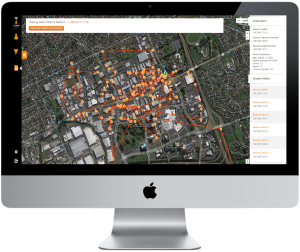 Lone worker tracking apps and devices, are an easy way to monitor lone worker safety and location so that the business or emergency services can respond immediately, preventing escalation and reducing the level of harm to the lone worker. GPS stands for Global Positioning System which is made up of 27 satellites orbiting the earth. These satellites transmit signals to GPS enabled mobile devices at regular intervals to measure the receiver’s location against the location of the satellites. The distance between the phone and each satellite, will determine an accurate location. Most smartphone devices such as Android, iPhone and Windows, have GPS capabilities, which can be turned on and off by the user. Once the location is recorded, it can then be stored on the device or transmitted to another device such as a computer, using SMS, GPRS, Wi-Fi or a 3G/4G connection – as is the case with the StaySafe app. How does StaySafe use GPS? Once a session is started on the StaySafe app, GPS data is used to determine an accurate location. The data is then sent to the StaySafe Hub and displayed against a map. GPS continues to update while in a session so that a journey is created in the Hub as the lone worker travels. The StaySafe Hub uses Google Maps so that the Hub feels familiar, accurate and works globally and in real time. For areas where the GPS enabled device is unable to receive Wi-Fi or data signal, StaySafe offer satellite solutions to communicate to the Hub via satellite networks. There is no doubt that there are some concerns when it comes to tracking employees. However, StaySafe is completely transparent when it comes to tracking its users. Lone workers and individuals using StaySafe, are only tracked while in a session, or if a panic is activated. GPS tracking ends with the end of the sessions, leaving the lone worker in control. While the user’s routes are stored within the Hub, the only people who have access to this information are those monitoring the lone worker’s safety. Foothills Automation and Control are one example of a business using lone worker tracking. Foothills technicians work alone or in pairs, travelling between and on large sites. The business recognised that if an accident occurred, they needed a quick way to locate them so they could send medical assistance. You can see more examples of business utilising lone worker tracking, by visiting our case study page.